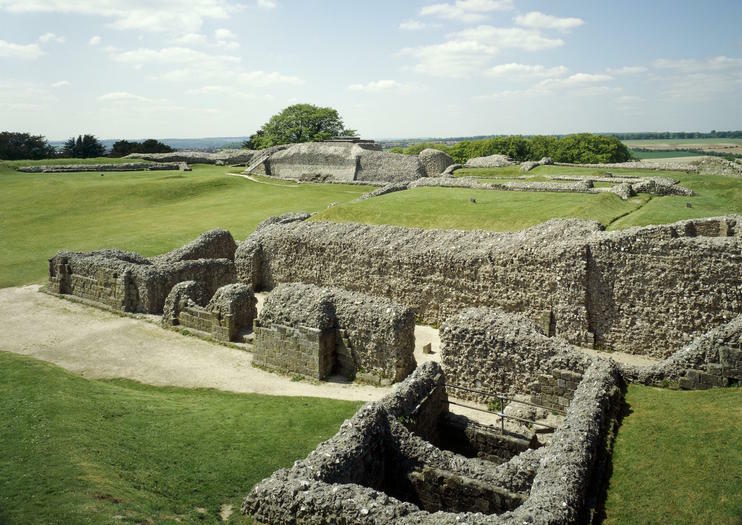 Just outside of Salisbury, England is the Old Sarum, one of the oldest settlements in the country. It was originally built as a hill fort and eventually grew into a castle and a cathedral. Towards the end of the Middle Ages, the cathedral was demolished and the settlement was mostly abandoned. Building materials from the old cathedral were used in constructing the new one located in the modern town of Salisbury. Today you can wander through the remaining foundations of the cathedral and castle and learn about the history of Salisbury's origins. The ramparts consist of two banks of earth separated by a ditch. On certain days, medieval tournaments, open air plays, and mock battles are held here. Old Sarum is located on 29 acres of rare grass chalkland making it a beautiful natural setting for exploring the Wiltshire countryside. Footpaths cross through the ramparts and offer views of the tall spire of the new cathedral. Old Sarum is not far from Stonehenge and is often included on tours of the region. Old Sarum is located 2 miles north of Salisbury off Castle Road. Opening hours are 10am to 6pm from the end of March to the end of September, 10am to 5pm in October, and 10am to 4pm November through the end of March. Adult admission is 4.20 pounds.